How fun are these! 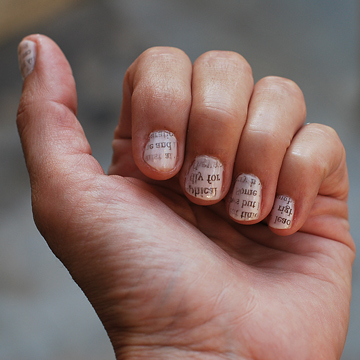 It's newspaper print on nails and it's super easy to do. 1. Paint nails with nail polish. 2. After polish has dried dip nail into alcohol. I used rubbing alcohol, but the directions suggests vodka. I was all out of my week's supply... ;) Kidding! 3. Press a strip of newspaper on top of the nail (nail should be wet with alcohol). 4. Gently pull strip away. 5. Apply a top coat after nails have dried. Not bad, but I smudged the index finger. I discovered this tute via Pinterest. On a different note, I've joined Facebook. I know. It was a moment of weakness. I've tried so hard to hold out all these years, but finally I was like what the heck. And you know what? So far so good. When you work from home you kind of miss co-workers. You don't get to chit chat about the kids, who's dating who, who's had botax (which I totally think Megan Fox has... I'm just sayin), and all that meaningful stuff. Now with Facebook, I consider my "friends" my co-workers. When I need a break from work I just click on over to the water cooler and chat. Anywho, I'm happy to announce there is a Jamie Christina Facebook page. As I navigate my way through the wonderful world of social technology, I'll add more to the page. Here's the link. super cute Jamie... love it. My vodka just ran out too... guess I gotta go get another bottle:) Just kidding too. Courtney wants to go get a light color of nail polish and try it too... love all your blogs by the way... I haven't gotten to read them all, but it is on the to do list. Wish we lived closer cause I would love to hang out with you :) Ciao from Italy! That is adorable! Im going to try it after I grow out my middle nail. lol It had an accident. Jen - I'll come hang out with you! I bet it's beautiful there. Yipeee and hooorayy to joining FB!! I am off to "Like" your page. I am so happy that i could connect with you on fb too! 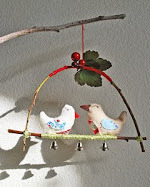 I hope your weekend is off to a wonderful start and wishing you a lovely merry happy sunday! Love to you! Colleen - Very clever of you! Hi Jaime! What's your FB name so I can add u? If it's private info, plz email it to me. Oops, I found the link & sorry I misspelled your name old friend. Feeling silly. Call me for a coffee or water brake. I'm home this summer. LOVE! My daughter and I are trying this this evening!! BTW, I lost your blog in the mix when my browser no longer supported my delicious app, sooooo happy I found you again. I adore your blog! I really like this nail paint.Actually,I have seen such a type of nail paint first time.Its look very cool and beautiful. Great synopsis of commenting and how to very well written and all that link love you just poured out, great post, if this was a forum you would have a sticky on this. It won't really have success, I consider so.